Five ideas to freshen your winter t shirt and jeans looks. 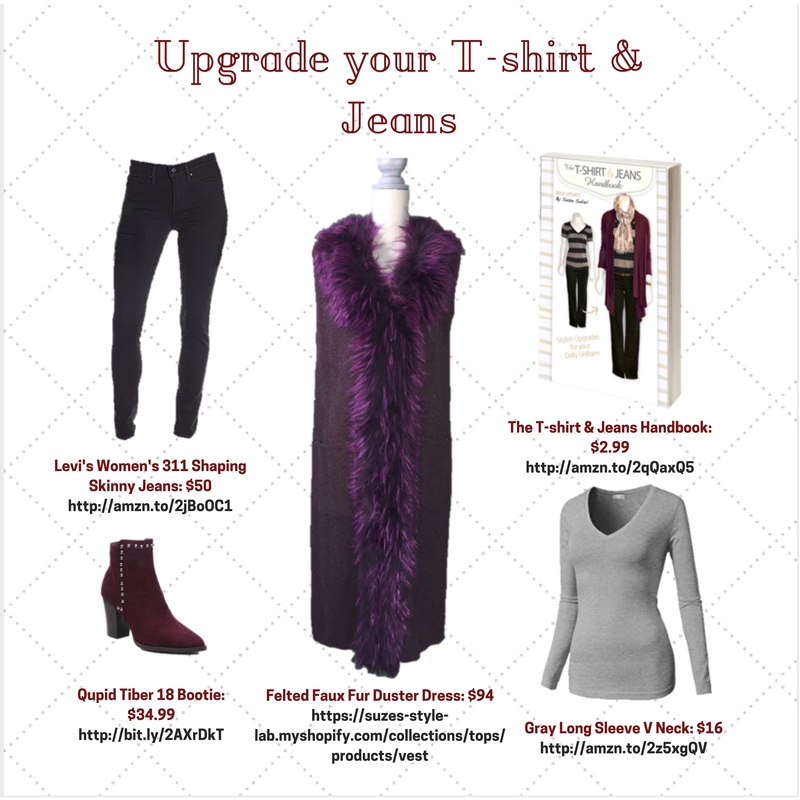 Are you TIRED of your old skinny jeans, wondering… what the heck else can I do with my T-shirt and Jeans that FEELS fresh and NEW? A long woolen Vest with faux fur trim might be just the thing for a GLAM holiday party, especially if you’re the HOSTESS! Velvet booties paired with your favorite neutral long sleeve v-neck T -Shirt (MVP of T’s) Black skinnies…and BAMM! New CHIC outfit! Have you read my first book The T Shirt & Jeans Handbook yet? I issued a 2nd edition recently, adding a whole bunch of NEW content, pix and How to’s. Click on the image above for an exploded view plus links; and re-invigorate your OUTFITS with a new item for the winter season, in the IT color: Raspberry -Wine. The team at Suze Solari Style would like to extend a most grateful ‘THANK YOU’ to all of our wonderful style – community members on this special Holiday week. You’ve made our collective group SHINE, and we appreciate YOU!